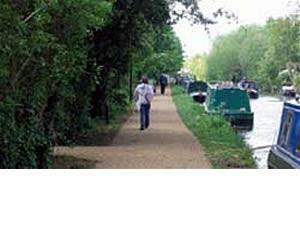 The Grand Union Canal Cycle Route at Leighton Buzzard Cycle RouteThis 6 miles of the canal towpath between Leighton Buzzard and Bletchley has been improved for everyone to use and enjoy - walkers, joggers, wheelchair users, cyclists, anglers and boaters. The route forms part of the National Cycle Network between Milton Keynes, Luton and London. How to get there by car/parking: Leighton Buzzard lies to the north of the A505, about 8 miles to the west of Dunstable. There is parking off of Leighton Road or at the train station. There is parking off of Leighton Road in Leighton Buzzard or at the train station. Car parking is also available in Bletchley at the Blue Lagoon Park. This 6 miles of the canal towpath between Leighton Buzzard and Bletchley has been improved for everyone to use and enjoy - walkers, joggers, wheelchair users, cyclists, anglers and boaters. The route forms part of the National Cycle Network between Milton Keynes, Luton and London.